European leaders are arriving in Brussels for their Summit #EUCO. It is expected to start at 15:00 CET with debates on the next seven year EU budget. Ralitsa Kovacheva #EUCO The leaders of #France and #Germany Francois #Hollande and Angela #Merkel highlighted the growth pact, which is expected to be adopted by EU leaders. Ralitsa Kovacheva Overall, European leaders at #EUCO are not very talkative. Ralitsa Kovacheva Francois Hollande at #EUCO: There are very rapid solutions to support the countries that are most in difficulty on the markets, while they have made considerable efforts to straighten out their public finances. Ralitsa Kovacheva #EUCO Angela #Merkel said that we should do everything possible to combat youth unemployment. Ralitsa Kovacheva The #FT wrote that the euro working group has called an unexpected meeting for today at 5pm. It is not clear why but the last the EWG has met at the same time as a big summit was during last year’s marathon negotiations over a second Greek bailout, the FT recalled. Ralitsa Kovacheva #Dutch PM Mark Rutte at #EUCO: There are instruments available for countries who say they can't cope on their own in the short term but I don't see no necessity to think up new instruments. Ralitsa Kovacheva #Dutch PM Mark Rutte at #EUCO: We don't solve problems in Europe by transferring sovereignty, we solve the problems by sticking to what we have agreed to. Ralitsa Kovacheva #Dutch PM Mark Rutte at #EUCO:Even if шгещ get help from Europe, Spain and Italy must continue to make reforms, one measure does not replace the other. Ralitsa Kovacheva #EUCO The Czech PM seems quite nervous while entering the rooml. Ralitsa Kovacheva #EUCO Francois #Hollande broke the tradition of Sarkozy and came into the room with Danish Prime Minister Helle Torning-Schmidt not with Merkel. Ralitsa Kovacheva #EUCO Bulgarian PM Boyko Borissov is explaining something to Herman Van Rompuy so long that formed a queue at the door. Ralitsa Kovacheva #EUCO Both Bulgarian PM and his interpreter are waving so much that Van Rompuy is wondering where to look. Ralitsa Kovacheva #EUCO #Merkel is discussing something with Portuguese PM and seems very worried. Ralitsa Kovacheva #EUCO All demonstrated respect for the Greek president. Ralitsa Kovacheva #EUCO The new Romanian prime minister was also specially greeted. Ralitsa Kovacheva We are expected to send a clear message about the way forward. where we want to go and how to achieve this,#EUCO president Herman Van Rompuy said at the opening. Adelina Marini The press conference of European Parliament chief @martinschulz has just started. He had 1 hour to present the positions of the European Parliament on the next EU budget. But earlier in Twitter he said that he intended to present the views of the institution on the developments in the EU. Adelina Marini #euco Schulz started with the words that on 28 June 1914 was killed Prince Ferdinand in Sarajevo and on the same date but in 1919 was signed the Treaty of Versailles. In his words, today is not such a dramatic day but it shows the responsibility of the EU leaders. Adelina Marini #euco The European Parliament chief spoke elaborately about his idea for an interinstitutional agreement between the EP, the Commission and the Council. According to him, the leaders had to endorse such an agreement, which had to be binding. It has to also include a deal for conclusion of the negotiations on the next EU budget 2014-2020. Adelina Marini #euco @martinschulz again reiterated before the EU leaders that the European Parliament was against any reduction of the size of the Cohesion Policy, as well as the social and the regional development policy. He recalled that Poland currently was a dynamic economy, which would have been in a recession if it was not for the cohesion funds. Same goes for Latvia, he added. Adelina Marini #euco The European Council considers the European Parliament an irritant, said the European Parliament chief, responding to a question of a Belgian colleague on the occasion of Martin Schulz's frequent complaints that he is often asked to leave the EU summits, while the heads of other institutions stay. Mr Schulz said that the fiscal compact was still not ratified, which allows the EP president to participate more deeply in European Council summits. In his words, if a working group is created with the heads of the European Council, the Eurogroup, the ECB and the Commission, then he made to the leaders clear that they have to invite the European Parliament too. Ralitsa Kovacheva Journalists tweeted from #EUCO that the football match Italy-Germany could be broadcasted tonight in the press conference room, negotiations ongoing with press service. Ralitsa Kovacheva ‏@EurActiv wrote that Finnish have tabled a “covered bond” compromise at #EUCO. The idea is governments to issue bonds as normal but these to be guaranteed firstly against specific assets within the member state. They would then have a secondary guarantee from the EFSF or the ESM, which would be available as a final backstop. Finland believes that such bonds could bring down the cost of borrowing in Italy and Spain. Adelina Marini #euco Obviously, in spite of the second half of the match GER/ITA there will be a press conference at the European Council and it is about to start any minute now. Ralitsa Kovacheva The press conference of the presidents of the #EUCO and the #EC is expected to start in a few minutes. Adelina Marini #euco There is an agreement on the growth and jobs compact, a major element of which will be 120 billion euros, Herman Van Rompuy said. Adelina Marini #euco It is not only about injecting money. This is a concern for everyone (growth and jobs), added the European Council president. Adelina Marini #euco On the 2014-2020 budget #MFF the leaders presented their funding priorities and discussed measures to get the best outcome for the money, explained Herman Van Rompuy. Adelina Marini There is relentless determination at the #euco the leaders to tackle the crisis. The Commission proposal on project bonds has been approved, as well as the increase of the capital of the EIB, Helle Thorning-Schmidt said. Adelina Marini Here's the problem at #euco - in the growth pact there is a clause on financial stability which the leaders did not discuss tonight but will discuss in the framework of the talks on the eurozone reforms. Adelina Marini There's no agreement on the single patent either at #euco. The stumbling block is where the seat of the patent court to be. The latest proposal is the seat to be divided into three. Adelina Marini Obviously there were quarrels on the country-specific recommendations as well (under the European semester). According to Jose Manuel Barroso, several PMs objected the Commission recommendations. He, however, described the discussion as "very interesting". Adelina Marini The presser that was supposed to be an intermediate, proved to be the last for tonight. The EU summit will continue tomorrow morning, so don't miss our live coverage on this website, on Twitter or on Facebook. Good night! Adelina Marini #euco Early this morning the eurozone woke up surprisingly with a long awaited solution - the rescue funds will be allowed to lend directly to financial institutions for recapitalisation. This became possible after the a decision of the eurozone leaders, which Irish PM Enda Kenny described as a"seismic shift of European policy". This solution, however, will be possible only after a special banking supervisory structure is built, which has to be ready by the end of the year. The European Central Bank also received the role, being insisted upon for months - to be an agent of the rescue funds. Further details later on this website. Adelina Marini #euco The EU summit continues this morning in Brussels. On her way for the Council Lithuania's President Dalia Grybauskaitė said that earlier this morning the first step was made towards a banking union and that it was yet to be done more. Adelina Marini Bulgaria's PM Boyko Borissov refused to speak to journalists on his way into the Council for the 2nd day of the summit #euco. Adelina Marini #euco It's a bit annoying that the president of #Cyprus, whom I personally have never seen speak to journalists on his way for summits, did not stop by today too, although as of next week his country is taking over the presidency of the Council of the EU. Adelina Marini Angela #Merkel looks good in spite of last night's football loss. She explained before journos briefly what had been agreed last night, emphasising specifically that the hated, particularly in Greece, troika was to be removed. Adelina Marini #euco The estimations that Angela Merkel was defeated last night twice (in football and in the council) seem exaggerated because her statement before journalists a few minutes ago makes it clear that she actually received what she wanted - allowing assistance (even for banks recap) against proper conditionality and on the basis of performance of these conditions. This probably explains why Monti did not seem that happy earlier this morning. Adelina Marini #Croatia's PM Zoran Milanovic was caught off guard with a question on #Syria. Yesterday he spoke with visible satisfaction before journalists about the need of deeper integration in the eurozone. He said that whoever contemplated that a monetary union could be created without strong fiscal bonds, did not what they were doing. Such mechanisms can work in times of prosperity not in times of a crisis, Milanovic added. Croatia will join the EU on July 1st next year. By then it is only an observer in the various EU formats. Adelina Marini Mario #Draghi will take part in the morning session of the EU leaders. I can't see Martin Schulz. Adelina Marini Angela Merkel is discussing something with ECB chief with concern on her face. In a moment they were joined by Mario Monti. Something's wrong. Adelina Marini All leaders are currently reviewing documents that were given to them a moment ago. Their session is to begin any moment now. Adelina Marini In the end of the #euco summit in Brussels the EU leaders have reached an agreement for the single patent, Herman Van Rompuy, the European Council president, reported on Twitter. The final news conference from the 2nd day of the summit is about to start shortly. Adelina Marini Angela #Merkel has just indirectly called on the Bundestag to vote as planned on the ESM (the permanent EZ fund) because the agreed changes in the early hours of this morning will take time to be hammered out. Merkel said this during her national briefing after the end of the EU summit in Brussels. Adelina Marini The conditionality the member states whose bonds will be bought on the secondary and primary markets to abide with the country-specific recommendations of the Commission, will be binding, Merkel underscored. Adelina Marini #euco The German chancellor confirmed that an agreement had been achieved on the patent court, according to which the seat of the court will be divided into three among London, Paris and Munich. Adelina Marini Before giving the floor for questions, Ms Merkel said that the summit was successful on all fronts. Adelina Marini #euco Francois #Hollande said at a briefing after Angela Merkel that he got what he wanted - the rescue funds to participate, without this ensuing additional adjustment efforts by the countries that need their involvement. Adelina Marini The #eurozone cannot function without sustainable fiscal discipline by all its members. This is the biggest contract among the member states, Herman Van Rompuy said at the final news conference after the end of the summit. 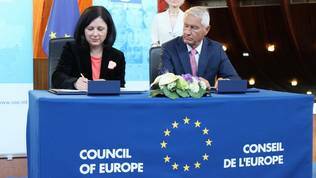 Adelina Marini Another good news which was expected - #Montenegro is starting accession negotiations with the EU yet this afternoon, the president of the European Council said. Adelina Marini The main seat of the patent court will be in Paris with highly specialised seats in London and Munich, Danish Pm Helle Thorning-Schmidt said. Adelina Marini We've endorsed decisions which were unthinkable only a few months ago, said with a boasting tone Jose Manuel Barroso, EU Commission president. In fact, he is the big winner from this summit because now there will be no way a country to object the Commission recommendations if it wants to receive EU financial assistance. Adelina Marini Of what Barroso quoted from the conclusions of #euco it becomes clear that an avoidance of a two speed Europe had been agreed with regard to the single market for financial services, as there were such fears, stemming from the eurozone statement earlier today. Later we will clarify what this means after we read the conclusions but Barroso highlighted this particularly. Adelina Marini Herman Van Rompuy @euhvr very well explained the achieved compromise - 'we have to rescue the countries with financial problems but they have to deliver". He said this responding to a request to comment on who was the winner and who the loser from the summit. Adelina Marini The closing news conference from #euco has ended. There are still many unanswered questions. Some of them will be answered to in the next days after we read carefully the decisions. Others will become clearer at the Eurogroup meeting on July 9. With this we end our live coverage of the summit, which unexpectedly met the expectations of being crucial :) Have a nice day and a good weekend! Don't miss to have an eye on us for deeper publications on the subject.